Mark Goldblatt, writing yesterday on “Hillary’s Hurdle,” suggested that Hillary’s “greatest obstacle may be that she cannot give the Democratic base what it so desperately craves,” and that her problem is not so much her October 2002 Senate vote, but the explanatory speech that preceded it. [W]e know that the goal, the important, essential goal of a democratizing Middle East is complex, and it is not without risks. A few months ago, I went for the second time to Iraq and Kuwait and Afghanistan and Pakistan, and I returned home with hopefulness about what I had seen and learned, but also with a sense of caution about how we should proceed. In Iraq I saw firsthand the daily challenges confronting the Iraqi people. I met with a number of our troops, the brave young men and women who are on freedom's frontlines in Iraq. . . . I flew from Baghdad to Fallujah in a Blackhawk helicopter; met with the Marines who had liberated Fallujah from the insurgents and terrorists. I met with many others of our Marines and soldiers who are committed to their mission to try to bring freedom to the people of Iraq. They, as well as the troops I saw in Kuwait and in Afghanistan, are committed to this fundamental belief that people deserve the right to be free, deserve the right to select their own government t. . . . So there is no doubt that America has started down a path, with blood and treasure, to try to create the condition for democracy and freedom in the Middle East -- which has consequences for the entire region, for our security, and certainly for Israel's. May 2005 was more than two years into the war, long after it was evident there had been no stockpiles of WMD, and more than six months after the 2004 election (with its relentless “Bush LIED!” themes, and John Kerry’s eventual repudiation of his support for the war). When Hillary gave her AIPAC speech, casualties had already (as she noted in her speech) exceeded 1,600 lives. If one felt that one’s vote was “mistaken” or based on “faulty intelligence” or “would have been different based on what I know today,” by May 2005 there had been more than enough time to reach that conclusion. [W]e need to recognize that our struggle, our ongoing struggle for freedom and democracy is the only way that we can ensure that in this shrinking, flattened world, our children will have a chance for peace and security. We cannot shrink from the duty that this time has imposed upon us. But what the Democratic base now “so desperately wants” is something much different -- and having given the above speech a year and a half ago, she cannot give it to them. I thought of that cartoon as I read the final TRB column in The New Republic by Peter Beinart -- author of “The Good Fight” (subtitle: “Why Liberals -- and Only Liberals -- Can Win the War on Terror and Make America Great Again”). Formerly a liberal hawk, he is baling out of the Iraq war. The Iraqis didn’t meet his expectations, and we’re apparently just too decent a country to do what is necessary to win a war like this. So he’s parachuting to a soft landing for him, moving on to other good fights, having discovered (as Hillary Clinton is learning) that a public mea culpa on Iraq is the re-admission price to liberal politics these days. And good luck to the Iraqis! They have lost, but they had the privilege of having Peter Beinart plead their case, until now. So here's my stand, such as it is. I don't care about 2008 or 2012. I don't care who's the frontrunner of either party, or who declares he's running, or who gets this money or that money, or who starts a committee. . . . I will only care about one thing: the next three months; the next three weeks, days, hours. This new guy, Petraeus, seems to at least have some idea of what needs to be done . . . so I'll support him and pray for him. For no other reason than the possibility of fixing this and "winning" is clearly our obligation and, not incidentally, the right thing to do. . . . Hineni. Beinart’s last essay pretty much proves the real point his book made. Larry Miller’s latest essay does as well. Senator Joseph Lieberman writes on "The Choice in Iraq" in today's Wall Street Journal, arguing for a cease-fire in Washington until it becomes clear whether General Petraeus's strategy can work: "We are at a critical moment in Iraq -- at the beginning of a key battle, in the midst of a war that is irretrievably bound up in an even bigger, global struggle . . . ."
Jimmy Carter appeared at Emory University yesterday to speak about his book -- keeping the stage to himself as he did last month at Brandeis University. The Emory Wheel reports that “Carter adamantly refused to appear with [Dennis] Ross,” as a group of Emory professors headed by Deborah Lipstadt had urged. At Brandeis, Carter declined an invitation to debate Harvard law professor Alan Dershowitz, but Dershowitz gave a speech refuting many of Carter's points after the former president had departed. "At least they had someone responding after President Carter left the building," Klehr said. "It's unfortunate that Carter, who has said he wrote this book to start dialogue and discussion, doesn't want dialogue and discussion." Carter yesterday “repeated an apology for a passage [on page 213 of his book] that critics said could be interpreted as supporting suicide bombings as a negotiating tactic” and said it “would be removed from future editions,” according to a report in Yahoo News. The sentence on page 213 urged Palestinians to “make it clear they will end the suicide bombings and other acts of terrorism when international law and the ultimate goals of the road map for peace are accepted by Israel” -- a formulation that obviously condones terrorism in the interim, as Emory Professor Mel Konner had written to Carter. 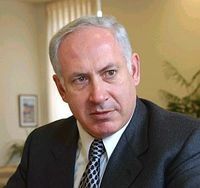 It is imperative that the general Arab community and all significant Palestinian groups make it clear that they will end the suicide bombings and other acts of terrorism when international laws renounce all acts of violence against innocent civilians and will accept international laws, the Arab peace proposal of 2002 and the ultimate goals of the Roadmap for Peace are accepted by Israel. There are several interesting aspects of Carter’s changed sentence. First, he found it necessary to substitute a new phrase -- “acts of violence against innocent civilians” -- in place of “suicide bombings and other acts of terrorism.” Perhaps that is because a Carter condemnation of “terrorism” would not satisfy many critics given his definition of it on Al Jazeera last month ("I don't consider . . . I wasn't equating the Palestinian missiles with terrorism”). Second, he substituted a new verb -- asking Palestinians simply to “renounce” acts of violence; previously he had called upon them to “end” terrorism (eventually). Why not urge them to start meeting their Phase I Road Map obligation now, and dismantle their terrorist infrastructure? 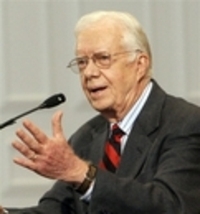 The best Carter can apparently do is urge the Palestinians to accept “the ultimate goals” of the Road Map (like the Palestinians themselves, he is a fan of Phase III but not of Phase I and II) and endorse the Arab peace proposal of 2002 (which includes a “right of return” he must know is a non-starter). It is admirable that he has revised a sentence he acknowledged at Brandeis was “worded in a completely improper and stupid way,” and apologized for it both there and at Emory. But there is a lot more that Jimmy Carter (and perhaps only Jimmy Carter) could do for peace -- including disabusing the Palestinians of their insistence on a deal-killing "right of return," and emphasizing their need to comply with the agreements they have already made. It's also important that we've broken through the idea that the sequence of the roadmap, which is extremely important -- sequence is important and it makes sense -- but the sequence of the roadmap doesn't preclude talking about the destination. And for a while, we were stuck in the notion that you couldn't talk about the destination until you've fulfilled all the phases of the roadmap. And I think that was the frustration in the international community broadly and also in the Arab world, and so I think we've broken through that. Where did that “notion” come from -- the notion that the “destination” was to be talked about in Phase III, not before the parties performed their obligations in Phases I and II? [A]s a performance-based plan, progress will require and depend upon the good faith efforts of the parties, and their compliance with each of the obligations outlined below. Should the parties perform their obligations rapidly, progress within and through the phases may come sooner than indicated in the plan. Non-compliance with obligations will impede progress. Of course, to a prior Israeli leader, it was a deal. Hillel Halkin has a beautifully-written article on Tel Aviv in the current issue of COMMENTARY -- part history, part travelogue, and part political essay. "There's more going on in Tel Aviv than in Paris," a visiting French friend once said to me, and there is more going on in it now than there was then. Leaf through The City Mouse, the most widely circulated weekly entertainment guide for this town of 360,000 people. A recent issue picked at random has 154 pages. In a very partial summary of its contents, you would find written up, listed, or advertised in it a week-long festival of Irish music; 18 movie houses showing 58 different films; 35 rock and pop performances; 36 jazz and blues concerts; 27 classical music concerts; 29 evenings of Israeli singing; 46 plays, including Hamlet, A Midsummer Night's Dream, Antigone, and Death of a Salesman; nine dance concerts; 28 art-gallery exhibits; ten special museum exhibits; hundreds of places to eat and drink, among them nine newly opened pubs, thirteen newly opened restaurants, and six newly opened cafes; a lecture series on Tolstoy, Orhan Pamuk, Agnon, Flaubert, Bialik, and Walt Whitman; 34 stand-up comedy performances; 32 shows and story-telling performances for children; and over 100 workshops and courses in such subjects as wine connoisseurship, the martial arts, art appreciation, cooking and baking, body building, pregnancy, marital relationships, yoga, Judaism and Kabbalah, coaching, fashion, creative writing, music, acting and psychodrama, psychology, modern dance, belly dancing, and photography. Even in its early years, the contrast between the two cities was a staple of social commentary. . . Jerusalem was rooted in history, sanctified by tradition, home to a large and in part fiercely anti-Zionist religious population; Tel Aviv was predominantly secular from the start, free of sacred associations. In Jerusalem, the passions and claims of Judaism and Islam clashed continually; in Tel Aviv, Jews and Arabs lived apart. . . .
Jerusalem was the university on Mount Scopus, Tel Aviv the bohemian life of its cafes. Jerusalem was a stronghold of the political Right, Tel Aviv leaned Left. Jerusalem was study and prayer, Tel Aviv commerce and play. Jerusalem was the world of the spirit, Tel Aviv the life of the flesh. And so forth. The two cities were barely an hour's drive apart. Yet they had different personalities, atmospheres, styles, even literatures. The writers of Jerusalem, it was said, were refined, restrained, subtle; those of Tel Aviv direct and sensual. In the folklore of Tel Aviv, Jerusalemites were pale-skinned, conservative, inhibited, snobbish. In that of Jerusalem, Tel Avivians were coarse, materialistic, frivolous. . .
Tel Avivians could joke that the sidewalks in Jerusalem were rolled up at 9 p.m. and Jerusalemites could banter back that this was because the city's sole prostitute had moved to Tel Aviv to be less lonely, but there was an understanding on both sides that the two cities were complementary and that it was a matter of taste which you preferred. Everything was new, exotic, and exciting: the Arab bazaars and alleys of the Old City, the ancient Jewish remains from the First and Second Temple period, the new neighborhoods springing up across the old border to double and triple the city's size, the easy access to Bethlehem, Jericho, and a Palestinian countryside of biblical pastorality. It was a heady time. Foreign tourists flocked to Jerusalem, spending a week there and a day, if at all, in Tel Aviv. Jerusalem was now "in," Tel Aviv "out." The nationalist Right was gaining strength; nowhere in Israel did Likud, which had come to power for the first time in the 1977 elections, have a more faithful following. 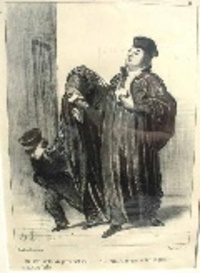 Religious immigrants from abroad were buying up property and forcing up prices. And while Jerusalem was growing more expensive, it was also growing poorer, because its tax base was narrowing and the jobs were all in Tel Aviv. The ultra-Orthodox were reproducing at Malthusian rates and invading one neighborhood after another; secular Israelis felt under siege. The city was growing shrill, grim, intolerant. The romance was gone from it. Such was the litany. And meanwhile, there, an hour away, was Tel Aviv, a beckoning oasis of normality. No zealots stalked its streets. Arabs were rarely seen in them; black-hatted Jews were not common, either. Palestinian-Israeli and secular-religious tensions seemed far away. . . .
[T]here is no "good" Tel Aviv as opposed to a "bad" Jerusalem for leftist Israelis to salve their consciences with. The Zionist project must be viewed as a totality, of which Tel Aviv was an integral part. . . . Tel Aviv, as its inhabitants were once well aware, owes its existence to Zionism and to Zionism's success in creating a Jewish state, just as it owes its future to that state's continued welfare. 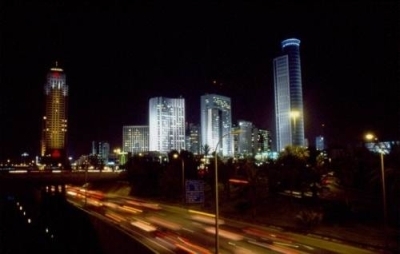 To enjoy Tel Aviv's riches while dissociating oneself from Zionism, like the son who happily spends his father's inheritance while disapproving of how it was earned, is sanctimonious. Halkin's multi-textured ssay is a tribute not only to Tel Aviv, but to the richness of Israeli culture, the diversity of its communities, and the complexities of its remarkable history -- all achieved while under relentless existential attack by those who have chosen death rather than life. One Jerusalem hosted an extremely valuable bloggers conference call today with Douglas Feith, former Under Secretary of Defense for Policy. * Our understanding of the relationship between Iraq and al-Qa’ida is evolving and is based on sources of varying reliability. Some of the information we have received comes from detainees, including some of high rank. * We have solid reporting of senior level contacts between Iraq and al-Qa’ida going back a decade. * Credible information indicates that Iraq and al-Qa’ida have discussed safe haven and reciprocal non-aggression. * Since Operation Enduring Freedom, we have solid evidence of the presence in Iraq of al-Qa’ida members, including some that have been in Baghdad. * We have credible reporting that al-Qa’ida leaders sought contacts in Iraq who could help them acquire WMD capabilities. The reporting also stated that Iraq has provided training to al-Qa’ida members in the areas of poisons and gases and making conventional bombs. * Iraq’s increasing support to extremist Palestinians, coupled with growing indications of a relationship with al-Qa’ida, suggest that Baghdad’s links to terrorists will increase, even absent military action. Iraq has in the past provided training in document forgery and bomb-making to al-Qa’ida. It also provided training in poisons and gasses to two al-Qa’ida associates; one of these associates characterized the relationship he forged with Iraqi officials as successful. Mr. Chairman, this information is based on a solid foundation of intelligence. It comes to us from credible and reliable sources. [U]ninformed and inaccurate press reports have persisted, generally on the theme that the Office of Special Plans allegedly conducted a rogue intelligence operation before the Iraq war and fed incorrect or exaggerated intelligence information to senior policy makers in the Executive Branch, bypassing the Intelligence Community and contributing to an ill-informed decision to go to war in Iraq. These stories have been repeated so many times that they are now taken as established truth by some members of Congress and many commentators. The Inspector General’s final report was sent to Congress on February 9, representing (in the words of the Defense Department news release) “the third determination that activities within DoD’s policy office regarding pre-war intelligence were both legal and authorized.” As Power Line has noted, they were also correct. On February 9, the Inspector General appeared before Senator Levin’s Senate Armed Services Committee and testified about the report. RedState has a lengthy report. During the bloggers conference call, Feith recommended that people also read the Iraqi Perspectives Project report entitled “A View of Operation Iraqi Freedom from Saddam’s Senior Leadership,” discussing interviews of Sadaam Hussein and other captured Iraqi officials, as well as captured documents from the war. He will appear on "Charlie Rose" tonight. Robert Satloff, the Executive Director of the Washington Institute for Near East Policy, has produced an extremely informative and perceptive analysis of the Mecca Agreement between Abbas and Hamas. Part I is here; Part II is here. Third, I call upon you as prime minister of the next government to abide by the interests of the Palestinian people and to preserve their rights and maintain their accomplishments and develop them and work on achieving their national goals as ratified by the resolutions of the Palestinian National Council meetings and the Basic Law articles and the national conciliation document and Arab summit resolutions and, based on all this, I call upon you to respect the Arab and international legitimacy resolutions and agreements signed by the PLO." As both Hamas and Fatah officials have made clear in recent days, nothing in the accord can be viewed as addressing the first two of the Quartet's conditions (recognition of Israel and renunciation of violence) and only through a tortuous interpretation of the final clause can even a loose connection be made to the third condition (accepting previous Israeli-Palestinian agreements). Neither "Israel," nor "peace process," nor "political horizon," nor even the word "peace" itself can be found. Not only is there a huge difference between "respecting" a resolution and agreeing to be bound by it, but because Abbas failed specifically to cite which Palestinian, Arab, and UN resolutions he asked Haniyeh to "respect," the Hamas leader could pick and choose from those he likes and those he dislikes. This critical paragraph is, in other words, worse than meaningless -- it is actually tantamount to a license for Hamas to interpret its political program as it sees fit, drawing on its own selective reading of the diplomatic history of the Arab-Israeli conflict. "I call on the Palestinian people to elect new leaders, leaders not compromised by terror. I call upon them to build a practicing democracy, based on tolerance and liberty. If the Palestinian people actively pursue these goals, America and the world will actively support their efforts. . . . And when the Palestinian people have new leaders, new institutions, and new security arrangements with their neighbors, the United States of America will support the creation of a Palestinian state whose borders and certain aspects of its sovereignty will be provisional until resolved as part of a final settlement in the Middle East." Now that the Palestinian Authority has formed a “unity government” controlled by a terrorist organization that proudly trumpets its refusal to recognize Israel, and not only refuses to renounce terrorism but gives it religious sanction, it is time for the administration to recognize that the Palestinians have neither the leaders nor the goals that President Bush envisioned five years ago. Anwar Sadat traveled to Jerusalem. Given a road map, indulgent driving instructors, and endless pocket change for the trip, the Palestinians went in a different direction. Boker tov, Boulder! has an important post on what we can be doing between now and May 14. Join the "one-man war." In the New York Times Business Section this morning,a long article on the impact of economic pressure: "West Adds to Strains on Iran's LIfeline." Western political and economic pressure on Iran over its nuclear program has chilled foreign investment to the extent that it is now squeezing the country’s long-fragile energy industry, adding strains to a government that is burdened by sanctions and wary of unrest at home. What Are We Doing May 14? [B]ack then a debate raged among Jews over whether a campaign to free Soviet Jewry was "too parochial," and whether being out front risked making it too much of a "Jewish issue." . . . .
As late as 1987, when the by then mature and powerful movement organized the largest-ever Soviet Jewry rally on Washington's mall to coincide with Mikhail Gorbachev's visit, some Jewish leaders wondered if the community could be mobilized, and if such a rally would be counterproductive. They warned that only a few thousand souls would brave the winter weather, and that the Jewish community would be considered "warmongers" who were spoiling the recent warming of US-Soviet relations. In actuality, over 250,000 people came to a rally that was pivotal in opening the floodgates, not just to 10,000 or 20,000 Jews, which seemed like a dream at the time, but to a million Jews who came to Israel over the following decade. Since it has been a while, a reminder is in order of what full mobilization looks like. First, as Shlomo Avineri has recently proposed, Iranian officials should get the Soviet treatment. Just as no Soviet official, including sport and cultural delegations, could travel without being accosted by protests and hostile questions, so it should be with anyone representing the Iranian regime. . . .
Second, an inventory of the governments and companies that provide Iran with refined oil, huge trade deals, and even military and nuclear assistance should be taken and public pressure be put on them to end their complicity with a regime that is racing to genocide. Third, the pension funds of US states should be divested from all companies that trade with or invest in Iran. This divestment campaign must be pursued without apologies or hesitation. Fourth, every country that is party to the Genocide Convention should be called upon to fulfill its obligation under that treaty and seek an indictment of President Mahmoud Ahmadinejad on the charge of incitement to genocide, which is a "punishable offense" under Article III of that treaty. Fifth, human rights groups, such as Amnesty International and Human Rights Watch, which are heavily nourished by Jewish values, passion and funding, must . . . press for enforcement of the Genocide Treaty, to stand up for human rights in Iran, and to oppose and expose Iranian support for terrorism. . . .
Two decades after the massive Soviet Jewry rally of 1987, we need to return to the Mall on Israel's Independence Day in May with two messages: Support Israel and Stop Iran. . . .
A decade after the wave of democracy that came with the fall of the Soviet Union, an Iranian-led wave of terror is rising that will not stop until it is stopped. Ultimately, we overcame our fear of parochialism to stand up for Soviet Jewry, and left the world a much better place for it. Now we must do the same to prevent a second holocaust, and in the process save the world. Israel Independence Day is Monday, May 14, 2007. Benjamin Netanyahu held a bloggers’ conference call today -- his second in six months, reflecting both the urgency of his message and his recognition of the importance of the new media in conveying it. Netanyahu described the U.N.-mandated cease fire [in Lebanon] as merely an interlude -- a first round with “the forward unit of the Iranian army,” armed with sophisticated missiles, with more coming. . . . He is skeptical about U.N. Resolution 1701, because the prior one (1559) was a better, clearer one -- and it “turned out to be totally useless.” . . . He believes Iran is the single greatest threat to our civilization, a state with millennial suicidal ambitions and missiles that can reach Paris -- a state with global ambitions and thus a global threat. . . . [W]hat we are witnessing is not just a dispute between Jews and Arabs -- he wishes it were, it would be simpler -- but rather the opening salvo of Iran’s bid for empire. I said recently in the United States that it is 1938, Iran is Germany, and it is racing to get nuclear weapons. This is in a nutshell the predicament we are in. Iran could be the first non-deterrable nuclear power -- that is fueled and motivated by hatred and ideology, a messianic apocalyptic cult that is willing to sacrifice millions of its own people for the mad and twisted vision of a reconstituted Islamic empire under Iranian rule. For this purpose they want to get nuclear weapons that will help them complete what they’re already doing, which is seeking to topple Lebanon and turn it into a Shiite republic. They’ve already taken over the Palestinian regime with their Hamas proxies. They are seeking to throw out the United States from Iraq and make it part of the Shiite crescent. But if they get nuclear weapons, then they would get control over the oil supplies and the Arabian Peninsula and topple many other regimes, [and] then be armed in such a way that they could foster terror on an unimaginable scale. But equally what they seek to do, as they openly say, is to destroy my country. While denying one Holocaust they are preparing another. So this obviously has to be stopped. And by the way, if they start with Israel, they’ll only start with Israel. Because just like the Hitlerian apocalyptic creed, it starts with Jew-hatred and then it spreads like wildfire to the rest of humanity. So stopping Iran is in the interest of civilization, and of peace, and of security. Iran is not invulnerable. It is quite vulnerable. Ahmadinejad just lost an election . . . because of economic woes -- high unemployment, oil revenue that doesn’t percolate down to his people, because of corruption and other bureaucracy. So Iran and this regime is vulnerable. So what I propose is that we make it more vulnerable -- put greater pressure on it, press the regime and make it stop its nuclear program. The most effective pressure that I can think of is to get large financial institutions in the West to divest from holdings from companies that do business with Iran. I spoke to the Treasurer of Massachusetts about getting the Massachusetts state pension fund to divest from Iran, as was done by the Missouri Treasurer. He said he needs the Legislature to do it, but that they’ll look into it. I spoke to Arnold Schwarzenegger, who happens to be a personal friend but also the Governor of California, which has the largest state pension fund in the world, 200 billion dollars in holdings covered. Obviously if we could get the ball rolling to get all these state pension funds to divest from Iraq -- this in addition to what the U.S. Treasury is doing in curtailing banking activity with Iran -- it puts formidable pressure on the regime. And one of two things will happen -- either it will work and obviate the need for stiffer action, or it will pave the way for stiffer action. It has to come under the rubric of divesting from genocide. And I know such resolutions have been fielded in the case of Darfur against the Sudan. I suggest a coalition of liberals and conservatives across the political band in the United States, divesting against genocide -- that is, the one that is being perpetrated, the one that is being denied, and the one that is being planned. I can think of no better purpose, no better moral purpose, no better purpose period. This is what can differentiate our period from the 1930s, by actually doing something. So let’s do it. We’ve been warned now, twice, and given a road map to peace -- a way possibly to avoid the Hobson’s choice of a pre-emptive strike against Iran or an eventual nuclear war that would start with Israel but not stop there. We need to do it before time runs out. "I can posit many, many responses -- those that are mentioned and some that are not, on the part of Iran. But none of them involve the risk, none of them begin to measure up to the horrible -- not risk, horrible certainty -- certain horrors I should say -- that await if Iran gets nuclear weapons. So at the end of the day, we have to prevent them from getting those weapons. Period." Essential reports on the Netanyahu call include those by Atlas Shrugs (who also summarizes the Q&As following Netanyahu’s remarks), Gateway Pundit (an “incredible talk . . . an exceptional call”), Mere Rhetoric (with Omri’s usual stellar analysis) and The Hedgehog Blog (with an insightful comment on divestment). Other bloggers whose reports will undoubtedly follow include Boker tov, Boulder! and American Thinker. The extended list of bloggers on the call is here, where you should listen to the entire 25-minute call. The alarm cannot be sounded loudly enough. If Iran is not put under pressure without delay and forced to choose between changing course and suffering devastating economic sanctions, the only remaining alternatives will be a bad one -- the military option -- and a dreadful one -- the Iranian bomb.